23 available 23 items in stock. 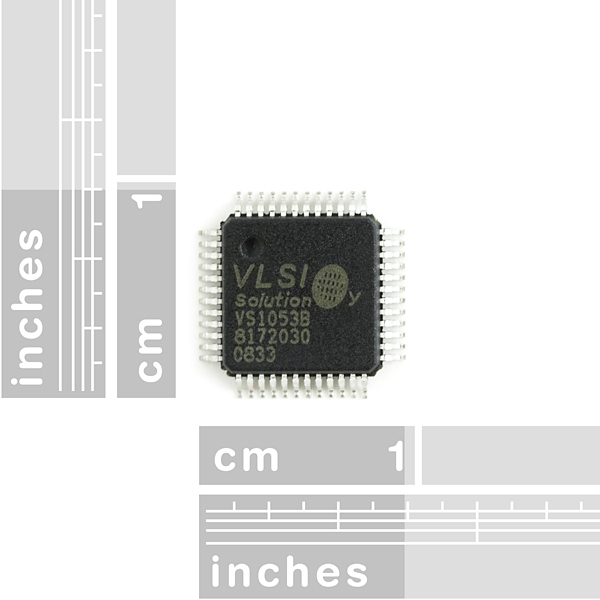 VS1053b from VLSI is a single-chip Ogg Vorbis/MP3/AAC/WMA/MIDI audio decoder and an IMA ADPCM and user-loadable Ogg Vorbis encoder. It contains a high-performance, proprietary low-power DSP processor core VS DSP4, working data memory, 16 KiB instruction RAMand 0.5+ KiB data RAM for user applications running simultaneously with any built-in decoder, serial control and input data interfaces, upto 8 general purpose I/O pins, an UART, as well as a high-quality variable-sample rate stereo ADC (mic, line, line + mic or 2×line) and stereo DAC, followed by an earphone amplifier and a common voltage buffer. can these run with an arduino giving it the comands, i'm thinking diy mp3 player. These are available on ebay for $6, so why is the price here so outrageous ?. 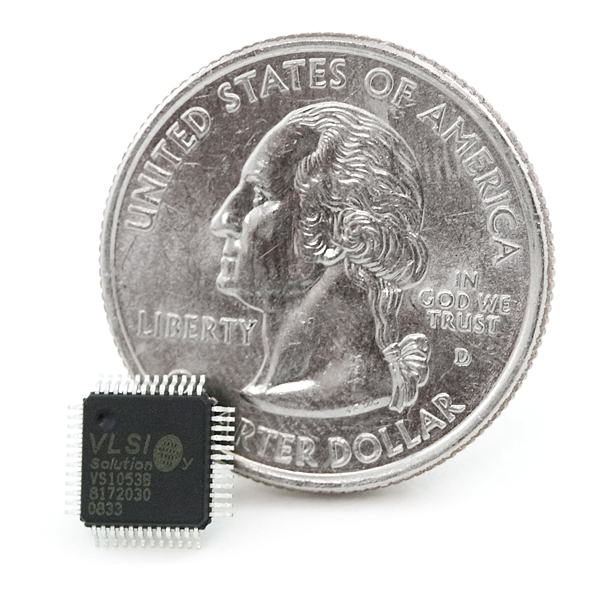 We get these direct from VLSI. I'm not saying you won't get what you want on Ebay, but just be careful. Anyone have any idea if this chip (or one like it) would be able to slow down and speed up the playback of a file? No pitch correction, just resampling? Are there any plans to make the VS1063 available? Upgraders will be happy to know that from a hardware point of view VS1063 is a drop-in replacement for VS1053. Hi, can anyone please tell me the latency of the chip from getting the command, until it plays wav/flac/ogg files from flash? Couldn't find that in the data sheet. Please restock these puppies !!! There should be a breakout board for this released within a week. I hope the breakout board comes soon. My unsteady hands are not fans of surface mount. I have an order ready to go, just needs a VS1053 breakout board added to it. 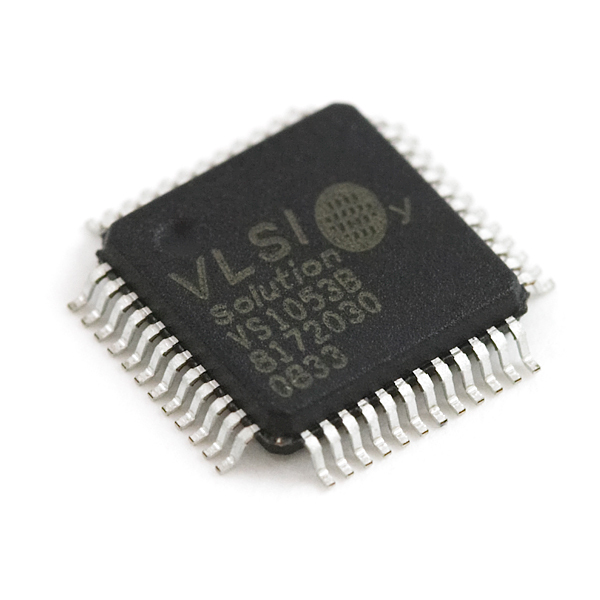 Will you be making a breakout board for this IC like the one for the VS1002?